Every painting has a story. Daniel Smith's goal is to make the painting process as memorable as your finished masterpiece. 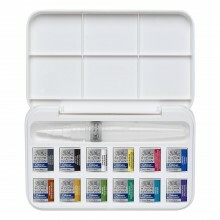 Daniel Smith have spent eighteen years developing the finest and most complete line of watercolour paint so you can create your own unique vision. 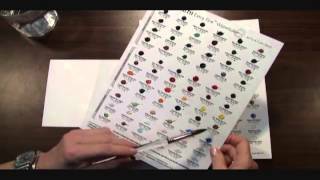 When you choose Daniel Smith Extra Fine™ Watercolours, your work will benefit from the extensive research put into all of their materials. Their passion for colour is only the beginning; the rest of the story is yours to tell. Since Daniel Smith started making their Extra Fine Watercolours in 1993, customers have responded by telling us about their favourite colours and combinations. Although each artist's method of colour selection is unique, most agree to start with basics, add strong secondary tones, and mix in unique and interesting favourites. The key to a successful palette starts with high-quality paint in primary tones. 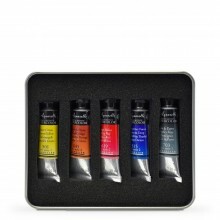 Beginners to the most advanced painters benefit from a selection of warm and cool primaries for colour mixing. To make a fiery orange, try mixing New Gamboge (a warm yellow) with Pyrrol Scarlet (a warm red). Cool yellows (like Lemon Yellow) are slightly green and are useful for creating vibrant green shades. These primary colours and their clean mixtures can be neutralized or brightened to suit your subject. Remember to add earthtones to complete your basic palette. Expand your palette with violets, greens and oranges to take your painting to the next level. These colours, situated between the primaries on your palette allow for complex and harmonious colour relationships. Some secondary colours are pre-mixed watercolours that are best bought by the tube because they are used so frequently (Sap Green is an example of a popular pre-mixed shade). Others are single pigment paints, like Quinacridone Burnt Orange, that add a serious pop to your palette but cannot be mixed using primary colours. Certain colours just have that "wow" factor. We've talked to many artists who find inspiration in the bold, unique and unusual pigments we offer. Add dramatic effects with an authentic mineral pigment from our PrimaTek® line or create a jewel-like shimmer with a Luminescent watercolour. Customer favourites like Quinacridone Gold or Rhodonite are sure to add excitement to your process.